Last week many Saint Rose students participated in activities to celebrate National Philanthropy Day. Students wrote thank you notes to generous alumni for supporting the College and participated in friendly trivia competitions about their beloved Saint Rose. Weeks before Thanksgiving students remembered the meaning behind the holiday season and shared feelings of gratitude and warmth. Back in 1931, Saint Rose students celebrated Thanksgiving in the fall number of The Rambler. 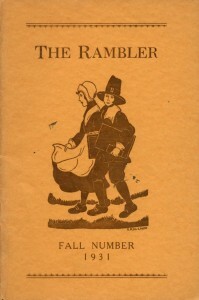 The Rambler was a quarterly student publication that printed social announcements, essays, poems and fictional stories. Like today, students enjoyed the delicious eats of the American tradition but also took the time to reflect on what made them grateful. On page three of The Rambler is the short story “Why Officer Muldoon was Thankful” by Kathryn Allen, class of 1933. The story begins on a frosty autumn night and Officer Muldoon marches through the snow and enters a lunchroom. Cold and with little money, the owner of the lunchroom offers Officer Muldoon a cup of coffee free of charge. Officer Muldoon has a sick son at home and explains to the owner of the lunchroom that he cannot afford the doctor’s bill. After Officer Muldoon leaves, the only other patron of the dining hall remembers a situation similar to the one of Muldoon’s and leaves the lunchroom in his heavy black fur coat. Alone, Officer Muldoon shamefully acknowledges the things his family deserves this Thanksgiving when suddenly Muldoon sees a small dog shivering in the snow. For a moment Officer Muldoon thinks of how happy a dog would make his son. As Muldoon picks up the dog, a man dressed in a heavy black fur coat approaches him and explains that the dog Muldoon found is his wife’s lost dog and that the fifty dollar reward for finding the dog is his. However, Mrs. Man-in-heavy-fur-coat does not want the dog and tells her husband to get rid of it. Later, Officer Muldoon is stopped by another man who asks him if he knows of a good home for a small dog. When Officer Muldoon says yes he is presented with the same dog. To read the original story “Why Officer Muldoon Was Thankful” check out the digital publications collection on the Archives web site or click the link. In this edition of The Rambler the editor-in-Chief Carolyn Fales Buchanan introduces several articles as if the publication were a play. She calls stories and ramblings “performances.” And in the final pages she says, “Oh, but don’t go away! The Rambler has something to say. In its loveliest manner the Rambler wishes you a happy Thanksgiving Day!” Through the heartwarming tales and the sincere musings on friendship and Thanksgiving the contributing writers of The Rambler suggest that this much loved holiday is more about blessings and gratitude than about the food. Me, I’m grateful for both meanings, dinner and thankfulness. Sounds like a recipe made in heaven.